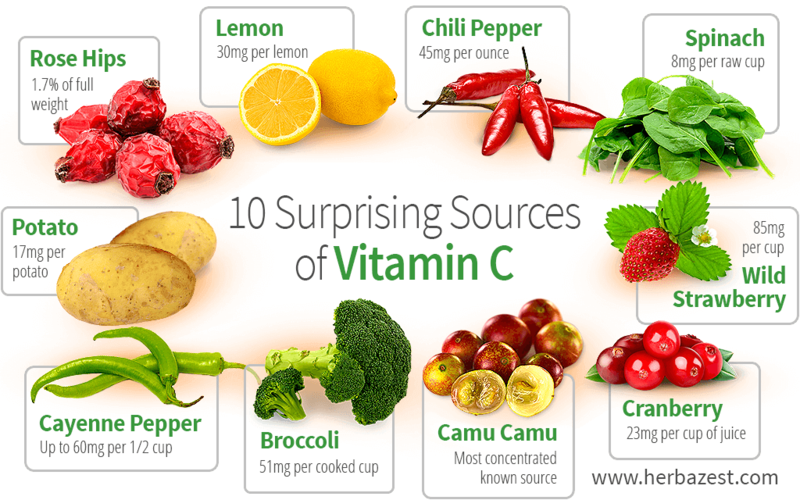 The antioxidant properties of vitamin C make it an effective food preservative. Vitamin C is one of the most important components in a healthy diet. The body uses vitamin C for growth and repair, and it serves a considerable antioxidant purpose in the body to boost immunity from disease. Unlike most mammals, humans cannot create vitamin C in the body, so they're reliant on consuming it. It's no secret that most fruits and vegetables have a high vitamin content, but oranges are widely publicized as the go-to fruit for vitamin C. Keep reading to discover other herbs that have vitamin C levels that are equal to - if not higher than - oranges. Lemons contain high quantities of ascorbic acid, another name for vitamin C. The recommended daily consumption of vitamin C for an adult is 75 mg for women and 90 mg for men. An average-sized lemon provides approximately 30 mg. Lemon juice is a more concentrated source of the vitamin, as one cup contains about 95 mg.
Rose hips are the fruit that a rose plant bears; they mildly resemble berries, and are normally a medium red in color. They are 1.7% vitamin C. It may not sound like much, but rose hips are one of the richest known plant sources of the vitamin. Try adding chili peppers to a curry for a vitamin boost as well as a culinary one; one-eighth of a cupful, diced, contains around 45 mg of vitamin C. The amount of ascorbic acid can range by variety, but red hot chilli peppers tend to have more. Spinach is most noted for being a prominent source of beta-carotene (i.e., vitamin A), but it contains a significant portion of vitamin C too, at 8 mg per raw cupful. Cooking the spinach slightly raises this amount. It may be particularly surprising to learn that a medium-sized potato offers 17 mg of vitamin C, as these are generally considered to be "starchy" vegetables. Potatoes are also easy to incorporate into a variety of dishes as a side dish, making them a convenient source for consuming part of the daily recommended dosage. This delicious and popular summer fruit contains 85 mg of vitamin C per cupful of whole berries. Cultivated strawberries (Fragaria ananassa) are also rich in this antioxidant vitamin. Fruit salads and desserts that mix both types of strawberry make for an interesting flavor while also providing ample vitamin C.
Cayenne pepper, especially the green bell variety, is especially rich in ascorbic acid. A vegetable that adds delicious crunch when served as part of a salad, half a cup of raw chopped green bell peppers provides approximately 60 mg of vitamin C.
Broccoli is another considerable source of vitamin C; half a cup of the vegetable, cooked, offers 51 mg. Likewise, Brussels sprouts (B. oleacea var. gemmifera) - a variety of the species to which broccoli belongs - contain contain 51 mg of vitamin C per cooked cupful. Broccoli and sprouts may be controversial vegetables in terms of taste, but there is no denying their importance as a source of vitamin C.
A fruit from the Amazon Rainforest, camu camu is a small package that holds the most vitamin C of any known source - 30 to 50 times more than what an orange contains. This high ascorbic acid content makes camu camu a common remedy for colds and the flu, especially in its native lands. Thanks to both its vitamin C and unique polyphenols, it is also a powerful antioxidant and can be used to reduce inflammation. One cup of cranberry juice has about 23 mg of vitamin C. Due in part to its ascorbic acid content, cranberry has been used for centuries to treat urinary tract infections. Consuming this fruit can also help prevent against future infections of the urinary tract and bladder by making those parts inhospitable to bacteria. The importance of improving the function of your immune system should not be underestimated; it is essentially the body's defense system against disease. Increasing your vitamin C intake to enhance immunity does not have to mean drinking gallons of orange juice. With the diversity of vitamin C sources, there is a way of working it into every meal, whether this means slicing strawberries on your cereal, squeezing lemon over fish, or serving up mashed potatoes as a side dish.